Hello, I'm Nadeem khan and the person in picture is my father, Name: Basith Khan Mohammed, Age: 49, type of Disease : Polycystic kidney disease. 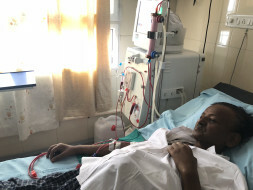 He is suffering with this disease since 10 years and from past 3 years he is undergoing dialysis treatment thrice a week, due to failure of both kidneys as well as hepatitis c virus infection in his liver doctors said his organs cannot be transplanted because of multiple complications. So the only way to save his life regular Dialysis treatment only, which is very difficult to manage along with medical and house expenses. To support my family financially I went to Saudi Arabia and worked there for an year but within very short period I came back as his health condition turned out so complicated that he has to get admitted in hospital for more than a month many times and now he is in semi bed sick condition and need my physical support to take him to hospital for dialysis. Hence I request you to please donate some money and support my family financially atleast for his treatment. I also request every individual who is reading this to pledge for organ donation after your death. It might help someone's life. Thank you for your valuable time and support in this regard. Attached is the discharge summary report for the treatment taken from past few weeks and we are still awaiting for the final bill receipt from the hospital. 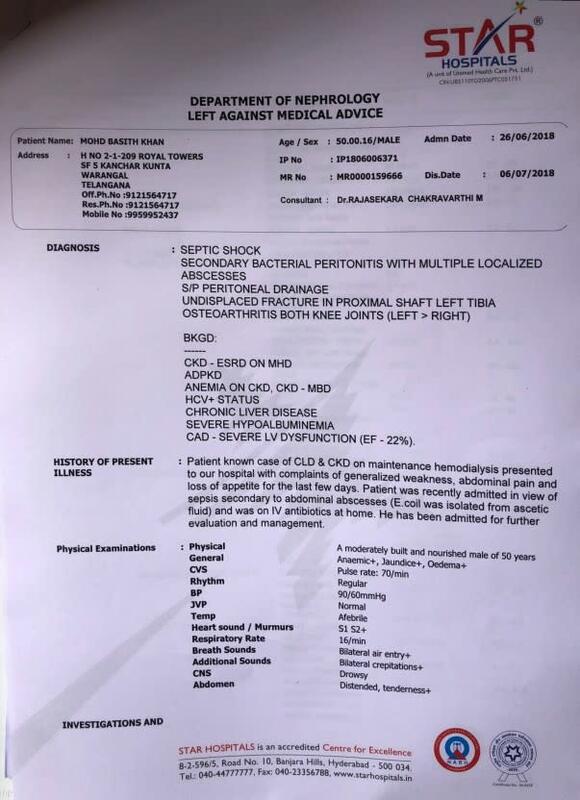 After a surgery in star hospital, when he slowly started to come over the peritoneal draining problem he has lost his energy in his body, fell down while travelling to hospital for dialysis and his leg got fractured. It is now more and more difficult for him to travel hospital so we decided to admit him in the hospital to avoid more such problems and help him in getting regular treatment. Thanks for your kind support and contributions. The contributed amount will be useful in paying all the pending bills of dialysis which were due from last month.